One of the first posts I created for this blog involved creating a list of the main banks in Mauritius. While the complete lack of comments may indicate that it was a waste of space, rest assured that it is actually one of the most-read posts on this blog (thanks to an incredible combination of insightful knowledge, good English, blogging skills, and a horrible layout). If you have not yet read it and shared it with your friends on Facebook or Twitter, I highly advise that you do so. In keeping up with my efforts to make this website the best source of information for everything related to Mauritius, this blog post will be dedicated to an analysis of the Mauritius Commercial Bank Internet Banking website. It's the most popular bank in Mauritius. 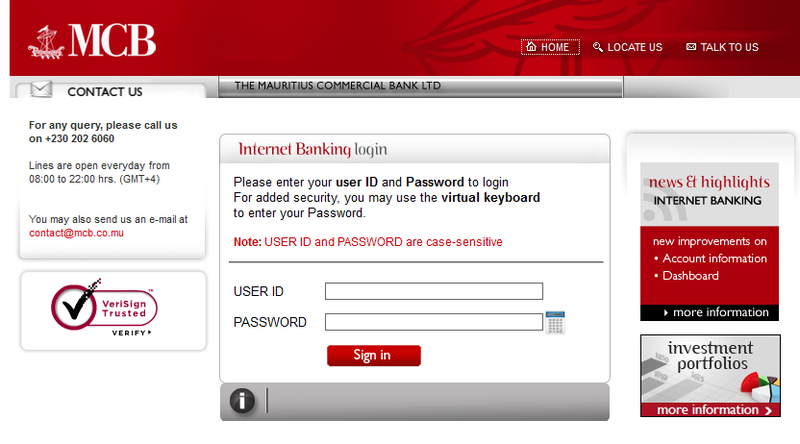 It supposedly has the best Internet Banking section of all the banks in Mauritius. I do not advance this statement as a fact since I have personally never used any of the other Mauritian banks' Internet Banking services. I have however surveyed a lot of people who use other banks in addition to the Mauritius Commercial Bank. There are many issues with the MCB's main website itself but I will not be covering those since it is distinctly user-unfriendly and there's not much to say about it anyway. It probably does a good job of providing information but is decidedly extremely ugly. As a side-note, its loan calculators never seem to work, so don't bother. 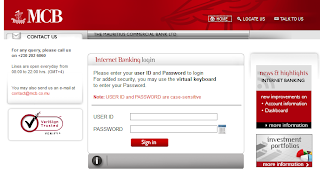 As far as its Internet Banking website goes, the MCB redesigned it in 2010. They essentially took a crap but functional website and made it a bit pretty but less functional. There are numerous issues with the new version, but I am however going to address only a few of the most glaring flaws. I have also tried to limit this post to include only those issues that people are bound to encounter regardless of the transaction they're trying to do on the Mauritius Commercial Bank website. Considering everybody needs to first log in to the website, this is the most logical place to start. The first thing that you will notice is the big warning that both your User ID and Password are case-sensitive. This is funny considering that the MCB's User IDs are always numerical. It sounds like a minor issue, but I've actually had the bank's support staff telling me to ensure my ID is case-sensitive while nevertheless knowing that there are no alphabetical letters in it. One extremely frustrating thing about the log-in process though is that it seems to do some sort of encryption on the client-side as soon as you submit the form. Consequently, you suddenly see the number of characters you typed in the Password box change right before your log-in details are sent to the server. I don't know who decided this is good idea, but it can be frustrating for users, particularly those who may think that something is wrong with their password. My guess is that many people are having log-in issues due to this. The dashboard suffers from not displaying the relevant information as it loads to show an extremely useless Initiated Transfers screenshots (basically online transfers and MCB Refills) screen, which nobody even bothers to look at for more than 1 second. It would have made more sense to show the last transactions screen since this is what actually interests internet banking users, particularly at the end of the month where the number of log-ins probably goes off the roof. As it is, the MCB Internet Banking website breaks all usability rules, as it requires people to click at least a couple of times before being taken to their transactions. This is at least somewhat better than when the new website was initially launched as these transfers used to be ordered in such a way that you would see your oldest transactions first. Thankfully, they did change this after some time. Another huge issue with the MCB Internet Banking website is that its error messages (which will probably occur a lot!) are as unhelpful as Scooby-Doo. If you mess up your password while attempting to initiate a transfer, the only notification you will get is an "Error 400" (or some number; I'm sorry but I'm not very good at remembering random numbers that are not associated with any descriptive text and which do not mean anything to me) warning. 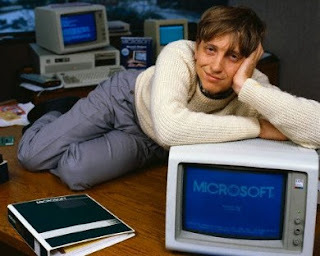 Good luck trying to figure out what you did wrong because the MCB website specializes in cryptic error messages that would make even Bill Gates groan in his sleep. The Mauritius Commercial Bank's website also suffers from atrocious loading times. I cannot count the number of times I've had to close it and attempt to log in again because it was still loading after 5 minutes. The good news is that these loading time issues can pop up at any time, which makes using the website as fun as slamming your head into an oven (while it's on). The problem was noticeably worse during the first five months after the website was launched (officially dubbed the most ill-fated website launch in Mauritius) but does occur less frequently now. However, the fact that I try to log in to the MCB Internet Banking website during off-peak hours may have something to do with it. The MCB should definitely have a different team look into all these issues since they make the website extremely frustrating to use. Or just revert back to the old website, which at least was not so slow. Additionally, if you too are using MCB Internet Banking, don't forget to share it. The more people complain, the more likely we will (not) be heard. After all, this is Mauritius!